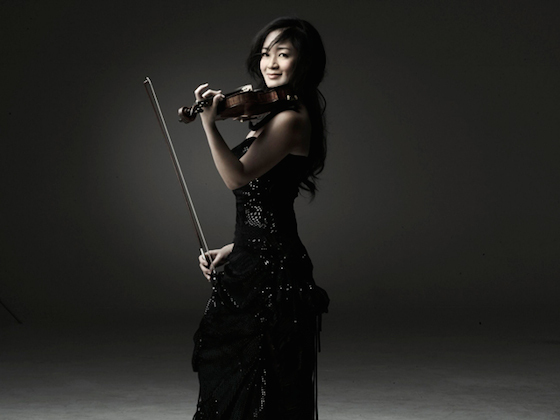 Chee-Yun performed the Tchaikovsky with the Tucson Symphony Orchestra. Arizona Daily Star: "Chee-Yun....was nothing short of breathtaking in her solo turn at Tchaikovsky's technically challenging Violin Concerto in D major. Her pristine 1669 Francesco Ruggieri violin, reportedly buried with its owner and re-emerging in 1991 with no scratches or wear and tear to hint at its antiquity, produced the lushest, most gorgeous sound. There were no wolfs, as she called them, little hiccups and distortions that can muddy the works especially on a piece that demands so much of the musician." Anne Akiko Meyers performed Vivaldi's "Four Seasons" with the Des Moines Symphony. Des Moines Register: "...the familiar melodies sounded bright and nimble, and Meyers' tone was as clean as Windexed glass." Joshua Bell performed works by Schubert, Grieg and Prokofiev in recital with pianist Alessio Bax. Violinist.com: "He may have the timeless look of a young man, he may entertain us at times, but he also has the conspicuous maturity of a concert artist that has been at his craft for 40+ years." Pinchas Zukerman performed Bruch's Violin Concerto No.1 with the National Arts Centre Orchestra. Herald Scotland: "Centrepiece of the programme, of course, was the legendary violinist's performance of Bruch's First Violin Concerto, as rich and warm as you would expect from one of the great violinists of the era, though there were a few moments, notably in the finale, where balance between Zukerman and his splendid orchestra was slightly askew, often an issue where the soloist is the director." Edinburgh Guide: "The highlight of the evening without doubt was the Bruch Violin Concerto No 1 where Pinchas Zuckerman not only played the solo part but conducted too. The audience loved it." Yuriy Bekker performed the Beethoven with the Charleston Symphony Orchestra. The Post and Courier: "Nuance and sensitivity informed this performance, too. Bekker's showed off Beethoven's nicer, gentler side, providing a sweet yet full tone and a fluid, unrushed interpretation. The orchestra might have provided a little more dynamic contrast, but what it did offer was a full-bodied sound during the famously long exposition and a most gracious accompaniment to Bekker's lovely playing." Agata Szymczewska performed Bruch's Violin Concerto No.1 with The Swan Orchestra. Exeter Express and Echo: "Agata doesn't just play well, either, she plays dramatically, proving with fancy bow flourishes and emphatic swaying that showmanship isn't purely the domain of more modern music either. She is rightly applauded back to the stage three times, finishing with a charming solo violin piece as an encore." Jeffrey Multer performed the Barber with the Florida Orchestra. Tampa Bay Times: "Multer's work on Barber's Violin Concerto was transcendent, perhaps because of its significance to him. He learned it during a difficult time in his own life, he said during the pre-concert conversation. He called the piece a 'breakthrough.'"